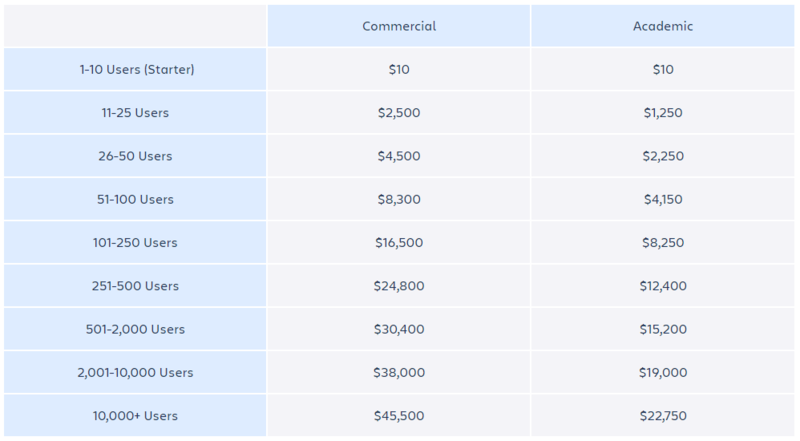 Jira Licensing: How much does it cost? And what's included? A first step to getting started with Jira is of course to buy a Jira license. Before you do that though, it’s good to know how much a Jira license costs, what a license includes and above all where do I buy those licenses. Direct? Through a partner? Direct is against all logic. It’s not the best option at all, neither support wise nor price wise. In this guide, we’ll explain to you how Atlassian Jira pricing works and how maintenance costs come into it. And how a partner like iDalko can help you reduce costs and optimize your license portfolio. Note: Atlassian also has pretty thorough information on Jira licensing here. But that can be a bit of a data-overload. That’s why we summarized everything you need to know in this post. How will my Jira license fee change when I want to add more users? How will my pricing plan change if I want to add more users to Jira Cloud? Getting started: Select the Jira that’s right for you. You can either run Jira from the cloud, treating it like a SaaS service like Dropbox or Salesforce, or you can self host Jira on your own servers. Or ours. Atlassian sets up and hosts the software for you. So it’s extremely quick and easy to set up a cloud implementation. You don’t have to deal with servers, storage or maintenance. The minimum service term for a cloud subscription is just one month. Therefore a Jira Cloud instance comes with more contractual flexibility than launching Jira on your own servers. Running from your own server gives you additional power and control. If you want to closely manage all the details of your Jira instance then a server setup may be the one for you. The Atlassian ecosystem consists of a vast amount of apps to extend your Jira to anything you could think of. 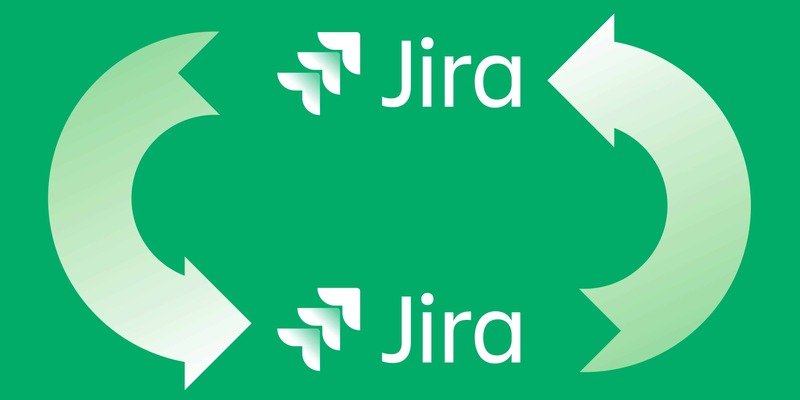 When it comes to add-on offering, Jira Server comes out ahead of its cloud counterpart. Some companies may prefer a server version because they can install it beyond their firewall. This gives them more comfort for security and privacy. Note: For larger organizations for which mission-critical environments are a priority Atlassian has a data center offering for Jira. While datacenter will be outside of the scope of this article, you can find out more about Jira data center offering here. 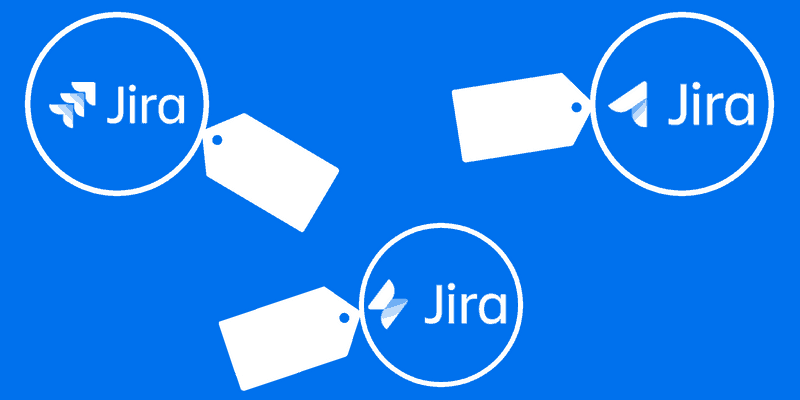 Now you know which Jira is right for you, let’s dig into what determines the Jira pricing. Jira Software and Jira Core for Server licenses are priced based on tiered bands of users. For example, 1 to 10 users, 11 to 25 users and so on. An annual license of Jira Software for Cloud is also based on user tiers. However, when you opt for Jira Software (and Core) Cloud on a monthly basis you run on a per-user rate. So tiered pricing is based on the number of users. 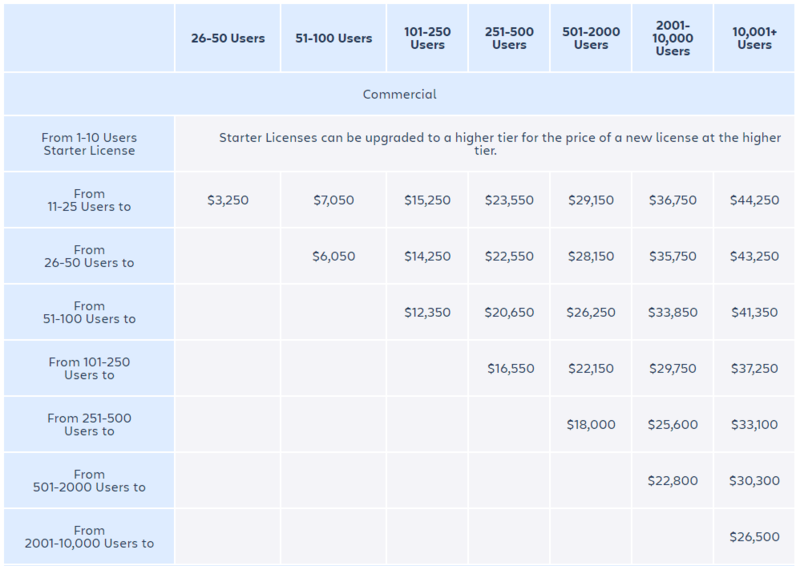 The more users you have, the cheaper the license is per user. A tip: Users are counted as individual named account holders. That also means you will pay for dormant users. So if you have accounts no longer being used, it’s a good idea to deactivate them. That way you’ll avoid unnecessary costs. Jira Service Desk pricing is also based on users, referred to as agents. Agents are users that communicate with customers and address their queries, change statuses and assign issues. A customer internal or external is free of charge when passing through the Service Desk portal. A customer creates a ticket, can comment and follows the evolution of his issues. A side note: Keep in mind that when using apps from the Atlassian Marketplace, pricing always follows the highest user tier of the Jira instance the add-on applies to. So, you might have an instance with 10.000 users and only one uses the add-on. You will still have to pay for 10.000 users. To get started with Jira, you can try it out completely free. All Jira Cloud instance come with a 7-day free trial. That includes Jira Core, Jira Software and Jira Service Desk for Cloud. On top of that, Atlassian also offers a 30-day money back guarantee. A Jira Server instance also comes with a free trial. That’s a 30-day free trial for an unlimited amount of users. This can be extended 2 times, making up for 90 days of trying out Jira for Server completely free. A tip: Add-ons from the Atlassian Marketplace can have a trial up to 180 days. Choose an add-on, go to the Pricing tab and at the bottom you have Pricing FAQ → Can I extend my free trial? You get a Jira Starters License when your Jira Software or Jira Core holds 10 users or less. Or when your Jira Service Desk instance holds 3 agents or less. These licenses have no limits in functionality. This license-type offers a pretty strong cost-advantage. So, once you go over 10 users (or 3 agents), you’ll notice a quite a price jump for both annual and monthly Jira pricing plans. That’s why I would recommend trying to keep your amount of users under 11 for small teams. By the way, Atlassian donates 100% of Starter License payments to charity. This means all transactions costs in the payment processing are absorbed. A normal Jira license will be noted as a commercial license. 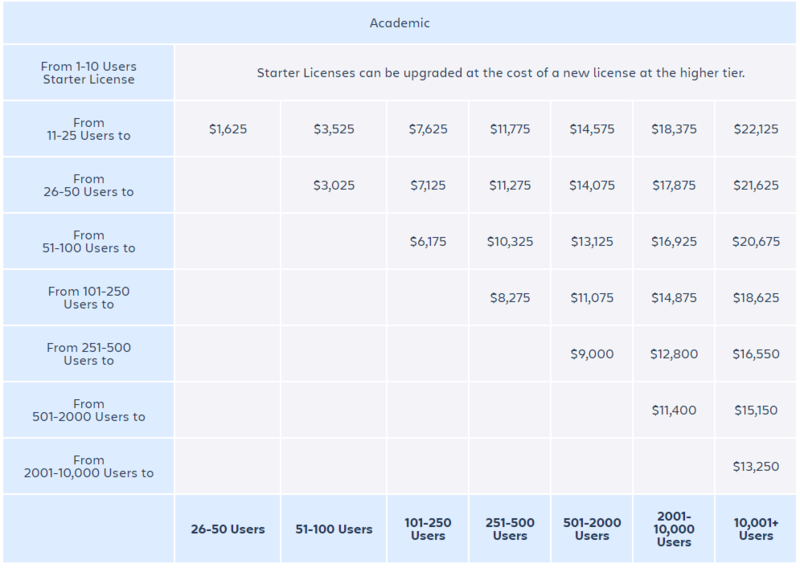 But there’s other license types such as academic or community licenses. If you’re in education you may be able to get a reduced price through an academic license. This includes qualified educational and academic institutions, libraries, research institutions and teaching hospitals. And they come with potentially big savings. Discounts aren’t available for government. But registered non-profit charities can also get a community license. If you feel you could fit into this category, you could apply for this community license here. With a Jira for Cloud subscription using Jira, maintenance is always included in the license cost. This means server storage, support, software updates and maintenance are taken care of by Atlassian. After the first year, you’ll have the option to extend your maintenance license at a price. This will be billed at half the cost of the original license per year. I’ll explain a bit more on the details of maintenance license costs further down this article. Note: Atlassian offers the option to purchase priority or premier support. This includes support with a better than standard SLA, like extended availability outside business hours. Find out more here. 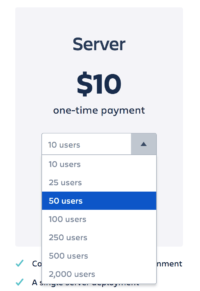 Dissecting Jira Server pricing. How much does it cost? Now you know about Jira’s pricing models, let’s find out how much your Jira instance will actually cost. 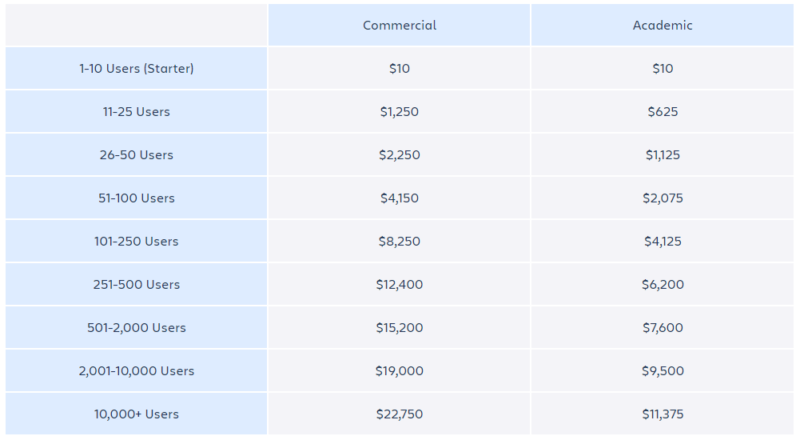 Here is an overview of the pricing tiers for Jira Software both for a “Commercial” and “Academic” license. These prices include a first full year of software maintenance. Jira software licensing for Server is charged per user, at staged levels. And, according to Atlassian working with Jira pricing tiers, sets out pricing to be ‘simple, upfront and equitable’. The Jira on-premise license enables you to run Jira on a single instance in production on a single server, and this on a perpetual basis. Sidenote: Data center versions, although on-premise, are not perpetual, they have a subscription model. The second component of Jira pricing is the cost of maintenance. The license itself is perpetual, but after the first year you’ll have to pay to keep the maintenance support going. As mentioned, it’s billed at half the cost of the new purchase license. If you’re worried about the expense of recurring support costs, you should note that you’re not forced to renew your support contract when it comes up. However, Atlassian recommends renewing support. They also recommend deploying updates as they become available. An example: if you have 9,000 active users, then Jira Software will cost $33,000 and then $16,500 a year for ongoing maintenance. Don’t worry about forgetting to renew. Atlassian will remind you about the deadline 90 days before your contract expires. And you can also tick the box maintenance to auto-renew, so you can set it and forget it. A tip: You don’t have to be Einstein to calculate that after 3 full years without paying maintenance you will have saved money. As I said, it’s recommended to update in time. If you wait too long the DB structure can have changed. In this case, an update will cost you a lot more in resources. In some particular cases, like non-hightech manufacturing companies, they are suited with a solid setup. On which they rely for the coming 5 years. That can be a strategy. Don’t worry, Atlassian has this covered. You can move from one tier of users to another for a set fee as you move up. Here you have a simple overview of the pricing tiers for Jira Server. Again, these prices include 12 months of maintenance at the new user tier. When increasing the number of users, the prices (mentioned above) include a new full year of maintenance. An example: when you upgrade your license from 250 users to 500 users, you pay the difference between the two tiers as well as the cost of one years’ worth of maintenance at the new user tier. 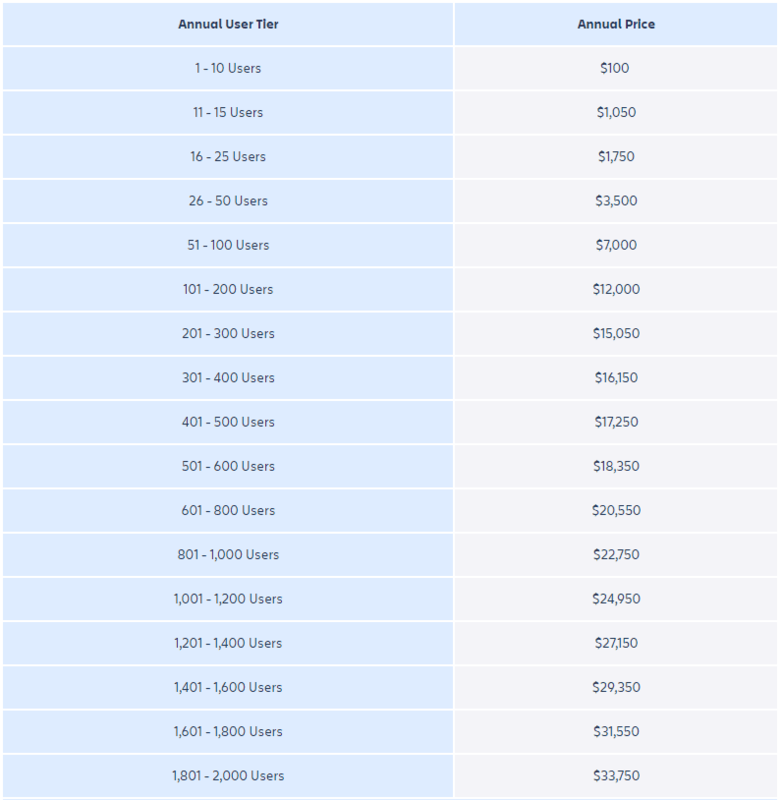 The mentioned upgrade price of 250 users to 500 users will result in a cost of $13,200. This includes the maintenance price of 9.900 USD and 3.300 USD for upgrading the license. It’s important to keep in mind that when you upgrade, you will reset your maintenance period. Hence, if you bought a license in April and upgraded in May then you would lose 11 months on the maintenance contract. Prepare the purchase order once that the number of users is nearing 251 users. Only execute the purchase order when it is really necessary. Note that a downgrade exists too. More information about Jira Software pricing can be found here. Dissecting Jira Cloud pricing. How much does it cost? You can also subscribe for the full year, in advance, for a defined user tier, with discounted rates kicking in at set stages. If you do that, you will pay for 10 months instead of 12. The defined user tiers with an annual subscription can be purchased through your Atlassian partner, no credit card required. Ask us for an offer you will be surprised. Side note, keep in mind you can always switch between monthly and annual subscriptions at any time. Support is included in both the monthly and annual Jira Cloud package. So you’ll always be running the latest version of the software automatically. Also, billing is based purely on active users. So, you won’t be charged for accounts you have ticked as inactive (monthly subscription only). And remember, you can get started with a 7-day free trial with a 30-day money back guarantee. So you can try out the product before you fully commit. Just like for Jira Server you will have the potential to add more users to your Jira Cloud as you scale. This is automatically calculated at the end of the month based on the total number of active users. Tip: if you remove applications or add-ons, the change will happen immediately and you won’t get a refund for services that have been removed. So take care when cutting! Request a quote for Jira for Server here. Request a quote for Jira for Cloud here. You can also purchase licenses via an Atlassian Solution Partner. Solution Partners typically offer additional services around license management, local currencies, invoices and adapted purchase processes. By assisting with onboarding, optimization and scaling, Solution Partners can help organisations to realise the full potential of the software. Even better, by helping you use the software far more efficiently, they can help you save significant amounts of money. Atlassian Partners are granted a partner-level dependant on the amount of certifications they obtained. The levels are: “Silver”, “Gold” and “Platinum”. We’re iDalko, a Platinum Atlassian Solution Partner for Belgium, France and Ukraine. Contact us if you need some help with licensing. And wish to discover what purchasing through a partner means for your budget and support. If you’re not from those locations, you can find your Atlassian Partner here. All Atlassian products and the almost 3500 add-ons of the marketplace can be purchased through a partner like Idalko. With the exception of start licenses, monthly subscriptions and Bitbucket cloud, which has a monthly pricing as well. At iDalko, we provide organisations with full support for Jira and other Atlassian tools, taking our clients from installation to optimization. As well as consultancy, monitoring, managing and updating your instance, we can also help you manage your license to optimise costs and stay ahead of pricing increases. Contact us if you need any help. Did this offer you any clarification on Jira pricing? 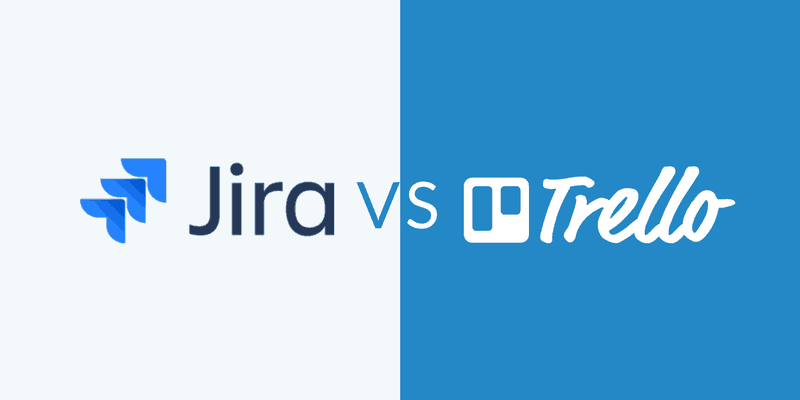 Do you prefer Jira Cloud or Server? Anyway, I’d love to hear your thoughts on this article in the comments below! P.S. : Also, let me know if you need help setting up the correct license for your Jira. We’re a Platinum Atlassian Solution Partner, so we can help you manage your licensing.